Do your auctions flop? Are your luncheons lame? Do your nonprofit fundraising events always seem to fall short of your hopes and expectations? Keeping the momentum going after the event is over. 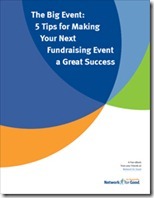 When you download the free ebook (all it takes is a few seconds to fill in a quick form), you’ll also get access to the Nonprofit 911 training webinar "How to Increase Attendance and Fundraising Results at Your Next Event."